Seattle Solidarity Network | Seattle Solidarity Network Wins First Multi-Worker Strike! 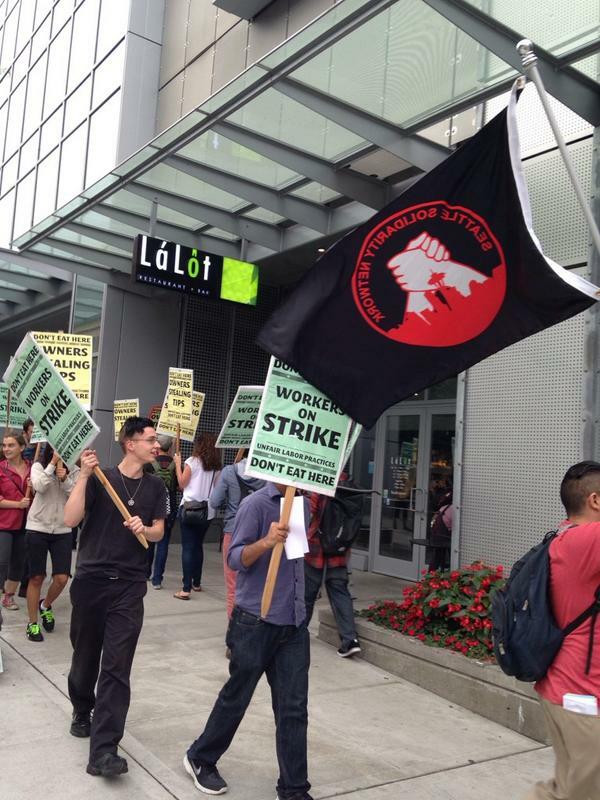 Seattle Solidarity Network Wins First Multi-Worker Strike! The owners of La Lot restaurant in downtown Seattle didn’t last long. Hien, Jeff, and SeaSol are proud to announce that, as of September 1st, La Lot management agreed to meet all of the demands set forth at the start of the strike! This means announcing a policy whereby all tips are distributed to workers, not to bosses, and restoration of Hien to her regular work schedule. The La Lot strike began after Hien, a server at La Lot, asked management to stop stealing workers’ tips. A reasonable enough request, it would seem, but her boss responded by drastically cutting her hours. Unable to survive on her dramatically reduced wages, and unwilling to accept such a glaring injustice, she started talking to her coworkers about fighting back. After some less-than-promising conversations with state and local government entities, Hien and her fellow worker, Jeff, contacted SeaSol to talk about a direct action campaign. On August 7th, Hien, Jeff, and over 50 SeaSol members marched into La Lot and delivered a letter containing the workers’ demands and announcing that Hien and Jeff were on strike against unfair labor practices. Almost immediately, three other workers, who were afraid to join the fight but also unwilling to work during a strike, left the job. Management’s attempts to soften the impact of the strike by asking other workers to take extra shifts were unsuccessful. By August 11th, after just one small flyering action, La Lot’s owner was openly expressing concern about the impact of the strike on their business. They asked for a suspension of the campaign while they negotiated to end the strike. After two days of talks, however, it was clear that they were not serious about meeting Hien’s and Jeff’s demands. Pickets continued during La Lot’s happy hours and lunch rush periods, doing increasingly serious economic damage. The number of customers during lunch was often cut in half, while the restaurant was nearly empty during happy hours. After two more weeks of actions, La Lot’s owner contacted SeaSol on August 27th to announce that she was ready to meet all of Hien’s and Jeff’s demands. Starting at the beginning of the next work week, managers and owners would no longer be entitled to any of the servers’ tips, and Hien would be restored to a schedule with the same number of hours she was working prior to the events that led to the strike. This is a major victory for the workers at La Lot and for SeaSol. The outcome of the strike obviously improves conditions for workers and serves as a potent demonstration of their power as an organized force. It is also a milestone in SeaSol history, as our first strike involving multiple workers. We hope this is the start of a trend of organizing larger numbers of workers to fight for their rights against their bosses. Just as important, this fight was not only about recovering stolen wages, but also about allowing the striking workers to return to work after the strike. As we celebrate this exciting victory, we remain mindful that the working class’ struggle against exploitation always goes on. Make sure you are signed up to receive updates from SeaSol, and keep up to date on this and other opportunities to support struggles by brave workers standing up for their rights!